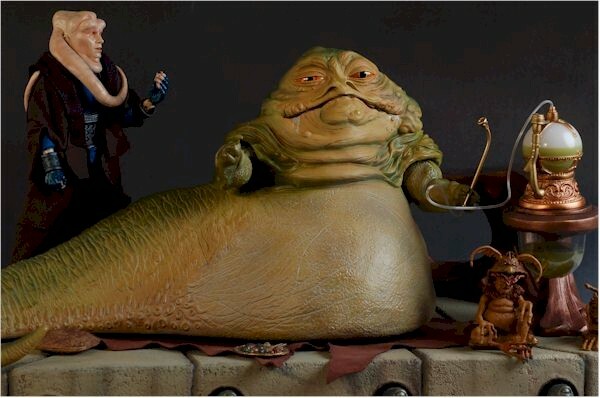 I received my Jabba the Hutt and Throne diorama this week, but thought that since Sideshow sells these puppies separately, I ought to review them separately. So I'll be covering Hutt here today - the inclusive edition to be exact - and the throne over at Quick Stop. That review is already up, so you can check it out. It's nice that Sideshow split these up for those folks that love the Jabba (who is as low as $100 right now from some dealers) but can't really afford the whole shebang. You can add this bad boy to the collection without having to go the full distance and pick up the throne, although I'd recommend grabbing them both if it's within your means. The inclusive edition includes one accessory, the ornate glass. 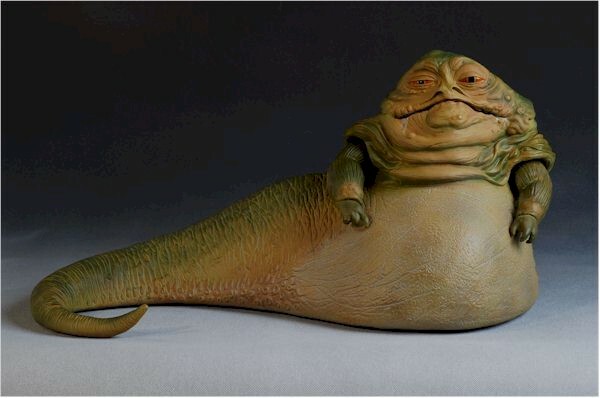 The regular version Hutt has no accessories. 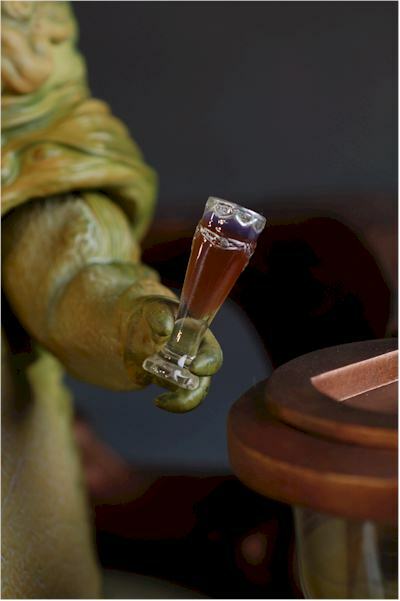 These are shipping from Sideshow right now, but if you're willing to go without the little glass, you can pick Jabba up at a number of online retailers. I have my usual suggestions at the end of the review. It's a big box, with some very basic photos of the prototype, and not much else. Since this is an inclusive edition, there's no numbering on the box or the figure. However, the Sideshow Exclusive sticker is on the front of the box. Inside is a nicely packed Hutt, very safe from any damage. The box serves the purpose, but doesn't have the pizzazz of the regular sixth scale offerings. 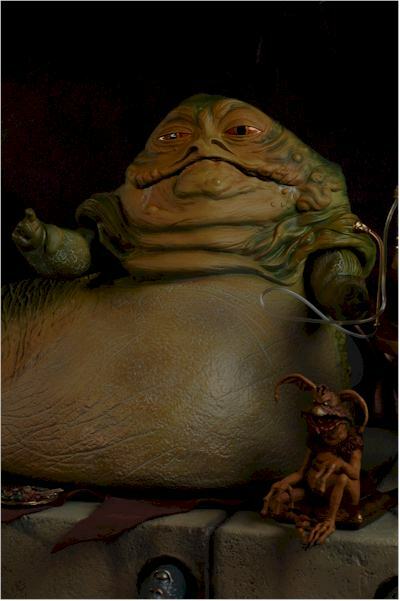 Ah, Jabba is a thing of beauty. And no one has ever said that about a Hutt before. The sculpt has wonderful skin detail, with rough lizard-like texturing over the back and tail. There's plenty of nasty warts, and the sly grin adds just the right expression to his face. One eye is closed more than the other, with a slit tilt to the nostrils. Small details like the tattoo on his arm are sculpted in, and this is an impressive figure in both photos and in person. 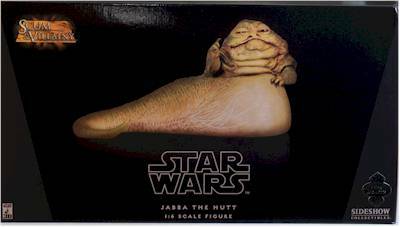 Jabba is hollow, a rotocast figure, but the body is fairly thick. The rotocast process has improved tremendously over the last few years, and even extremely small details in the sculpt stay in during the manufacturing process. And while he's hollow, he is complete - no holes in the bottom. The bottom has a large 'plug' that completes him. His size makes him in scale - pretty much - for the sixth scale line. He's just under 12" tall, and is about 20" long with a curved tail. He looks great sitting next to figures like Bib or Jedi Luke, and the dais/figure combination looks great together. His hands are sculpted in good poses, one sort of pointing while the other can hold the glass or the hooka pipe. They work pretty well with the limited number of poses you can get the figure into. 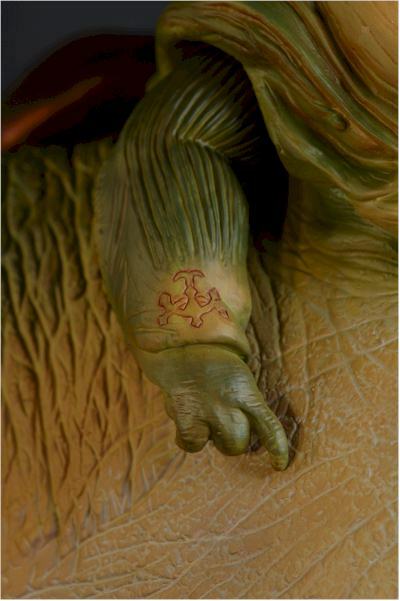 It's also worth noting that Jabba has a sculpted scar on his tail, that looks pretty painful. 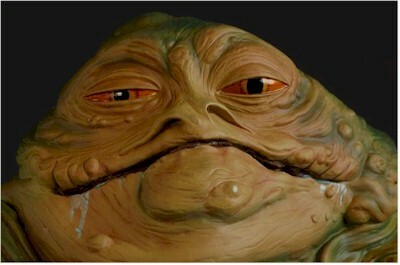 Jabba is a pretty gross looking guy, what with the folds of fat, warts and drool. The paint application is what really brings makes this ugliness real - and that's a good thing! While there's not a lot of different colors here (it's a very limited palette), the variation in shading and tone on the body is extremely well done. All the bright color is in the eyes, and there's a nice gloss applied to make them appear wet. The eye work was a touch sloppy, with the cut lines between the eyes and skin not quite as clean as I'd expect at this price range, but it's a fairly small nit. If you're looking for a super articulated Jabba, this isn't it. 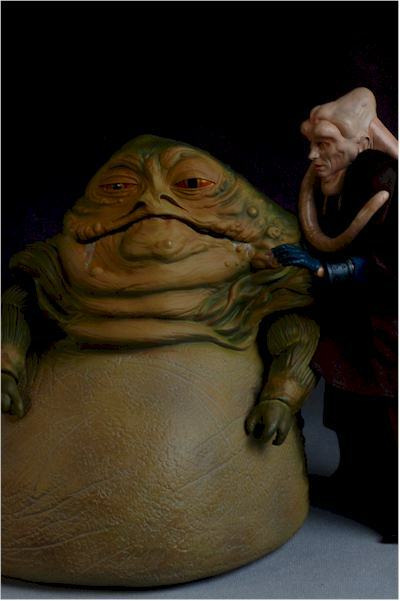 Of course, I'm not even sure what a super articulated Jabba could do. He's not exactly an Olympic gymnast. Nonetheless, the articulation is even more limited than you'd probably expect. He as joints at the top of each shoulder. These allow the arms to rise up and out slightly, and that's it. There's no cut wrists, so the position of the hand is dependent on what you can do with the shoulders. There's also no neck or tail joint. 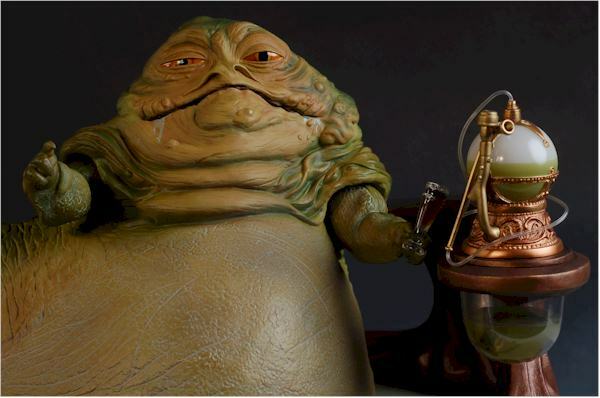 The inclusive version of Jabba has the ornate glass. This is filled with a red liquid. He can hold it in his left hand, or it can rest on the rail of the diorama. That's about it, and I suspect folks will be disappointed that he doesn't have at least a couple small snack treats, since one was already included with Bib. While this isn't a toy intended for kids, he's sturdy enough that they could actually play with him. There's no sharp edges, or dangerous weapons. And he's so light weight, you couldn't crush an ant with him. But the only kids that will be playing with this guy is the inner kid in you. This guy costs around $100 - $130. That's a reasonable price, and an average value. Find him less than a hundred bucks, and you can add another half star. Not a thing. This guy is sturdy, and there's nothing that will break or fall apart. While the throne isn't particularly useful without Jabba, you can certainly buy Jabba and skip the throne if you'd like. He's an excellent addition to the Sideshow sixth scale line, and while the general design might be simpler than many of the Jedi figures, he has none of their issues - no monkey arms, under or oversized head, or other proportion issues. Had we gotten a little more articulation or accessories, he could have been a possible four star figure. - CornerStoreComics has him at $101.99. - as does Amazing Toyz, who has just gotten him in stock. - if you're in the U.K., you can find the throne at Forbidden Planet for 140 pounds, or the Jabba for 70. - Dark Figures is the only dealer I know that has the throne available outside of Sideshow. Technically, this is a Sideshow site exclusive, but Dark Figures has them listed at the full $199 as well. - the Salacious figure to go with the throne is just $28 right now on sale over at Dark Shadow Collectibles. I've reviewed a ton of Star Wars 12" figures, the the ones that go most specifically with this set are Bib Fortuna and Jedi Luke.